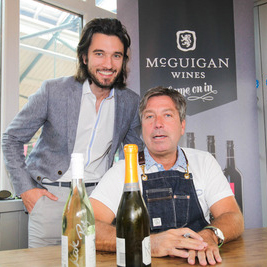 Hundreds of Northern Ireland’s foodies crowded into St George’s Market to watch celebrity chef John Torode host a McGuigan Wines food and wine demonstration on October 3rd. John captivated the crowd by pairing the perfect McGuigan varietal to each of the dishes he prepared from his new cookbook My Kind of Food. Attendees were treated to samples of McGuigan Black Label Shiraz, McGuigan Frizzante and McGuigan Sauvignon Blanc as they watched John cook posh curry cutlets, a steak dish and a fish dish with locally sourced clams, mussels and beansprouts. Australian Vintage wine ambassador and trained sommelier Ciaran Meyler was also on hand to educate the crowd on the rules of perfect food and wine pairing. John and Ciaran hosted an interactive question and answer session followed by an opportunity for fans to meet with the Australian chef and have their McGuigan wine bottles personalized and signed.